The greatest challenge we face as an industry is training and nurturing the next generation of data talent. What do I mean by data talent? It’s not just the data scientists or specialists who can develop data models, learn complex systems, and use programming languages to write queries to help others. We will no doubt need them. But it’s also the scientist who can easily explore millions of rows of environmental data that will help her address climate change. The teacher who can quickly analyze years of student records to teach more effectively. The small business owner who can make data-informed decisions to grow her sales. It’s everyday people like these who represent a vast opportunity to improve virtually all fields of human endeavor. If we can train more people in data analysis and interpretation, we have the opportunity to move the world forward by harnessing the tremendous power of fact-based reasoning. The report shows which higher-education institutions offer analytics-focused programs, what these programs look like, how accessible they are for students, and where gaps remain. For instance, we found that 20 percent of all four-year institutions in the US offer at least one analytics program to their students. These programs are clustered primarily in top-ranked four-year universities like Carnegie Mellon University, George Mason University, and the University of Washington. These three institutions top the list for the number of programs offered. 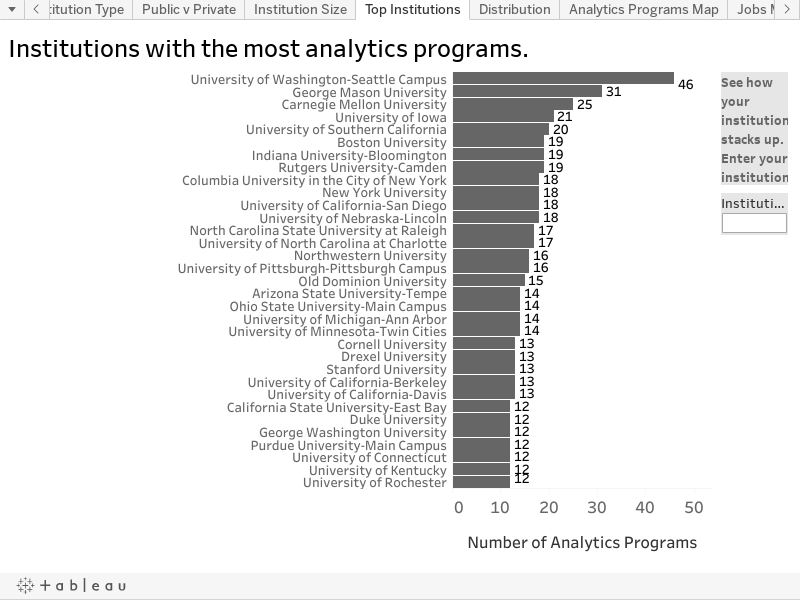 Few two-year institutions (about 2 percent) offer any analytics program at all. We interviewed instructors and administrators who indicated that analytics programs will keep growing in response to industry demands for these skills. A program director from the University of Texas told us the school created its business analytics program in response to a “crushing need for talent” from firms. We also heard that with analytics skills fast-becoming a baseline for all kinds of jobs, universities are adjusting to train students in more cross-functional skills. An associate director at Northwestern University’s School of Engineering told us that “companies were looking for graduates with not only the technical skillset, but also the business skills,” which affects the school’s approach to teaching analytics. As you’ll see in the report, we are making great progress in building a pipeline of analytics talent. We also hope our research helps spur further investment and interest from academia and industry to train the next generation of data workers. Read our report in full, here: tableau.com/data-education-2016. Excellent presentation. A wealth of information in easily readable and visually intuitive display. The information provided here illustrates the importance and growing demand for skilled professionals who can utilize tools such as Tableau to deliver actionable data to business decision-makers.